Tennis players rarely talk about international conflicts, preferring to play it safe by limiting their comments to serves and volleys. 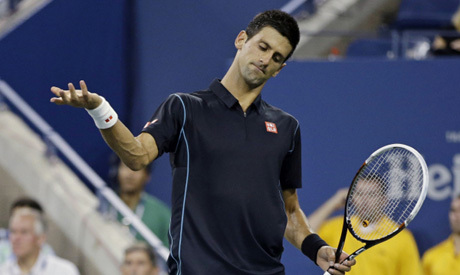 But the possibility of air strikes against Syria has recalled some painful memories for Serbia's Novak Djokovic and Ana Ivanovic, who broke from their usual routine at the U.S. Open to talk about their personal experiences with war. Less than two weeks ago, Djokovic addressed the United Nations General Assembly as part of the declaration for an International Day of Sport for Development and Peace next year. Then on Sunday, after winning his third round match at the U.S. Open, the world number one spoke about military strikes, recounting his experiences as a child. "I'm totally against any kind of weapon, any kind of air strike, missile attack," he told reporters. "I'm totally against anything that is destructive. "Because I had this personal experience, I know it cannot bring any good to anybody." Djokovic was not specifically asked about the possibility of military strikes against Syria, although the inference was clear when a journalist asked him for "any thoughts of what's going on now?" Djokovic's comments came as U.S. President Barack Obama and his top aides tried to persuade a skeptical Congress on Sunday to approve a military strike in response to a deadly chemical attack blamed on the Syrian government. The Serbian's candid response followed a personal account of his own exposure to war when he was a child growing up in Belgrade. "Those particular times that me and my fellow countrymen and colleagues from Serbia have been through is definitely, you know, a period of life that we don't wish anybody to experience," he said. "The war is the worst thing in life for humanity. Nobody really wins." Djokovic was 12 when NATO waged a 78-day bombing campaign in 1999 to end Serb ruler Slobodan Milosevic's ethnic cleansing and crackdown on ethnic Albanian rebels. He said that as a child, he did not understand everything that was going on, but remembered he didn't have to go to school and could spend more time playing tennis. "We spent the whole day, basically every day for two months, on the tennis courts with the planes flying over our heads," Djokovic said. "We really didn't mind. After a week or two of the bombings, we just kind of moved on with our lives. We did everything we could and what we wanted. We just let the life decide for us. It was not in our control. We were helpless, basically." Women's former world number one Ivanovic, also playing at the U.S. Open, recounted her experiences of the bombings in an earlier interview. "I do remember very well. The very first day it started actually, I was on the practice court," she said. "They came in and they said, 'Look, you know, we heard it's going to start tonight. You better go back home and just stop the practice'. "That was the first day, and then for about a week or two weeks we didn't practice because we didn't know what was going to happen."